Galaxy S6 & iPhone 6: Twinsies! Every single smartphone has some drawbacks. Your phone might be beautiful, but your friend's phone has better software. Your phone might have an amazing camera, but you want the battery life life of your sister's phone. But what if you could design the perfect smartphone? 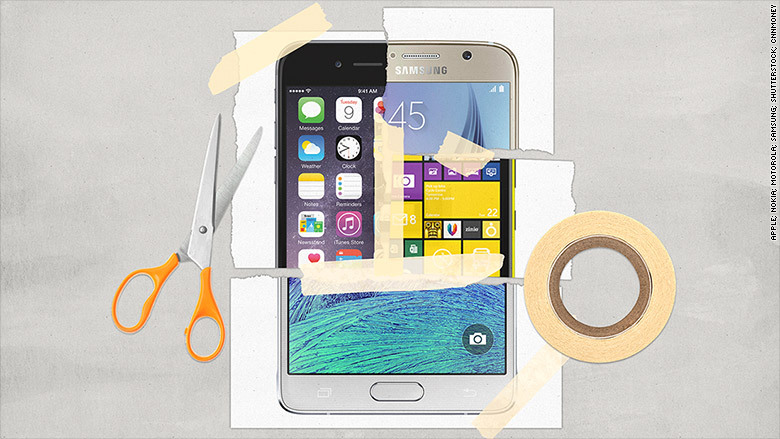 It's a fantasy: There's no such thing as a perfect smartphone. But there are smartphones that have near-perfect components or virtually flawless aspects and features. If it were possible to borrow a part of one phone and attach it to another, creating a kind of Frankenstein phone, here's what it would probably look like. Yes, it's a predictable choice. But the best-looking phone is the iPhone 6. Apple's (AAPL) intense attention to detail is unparalleled. The fact that the Samsung Galaxy S6 looks nearly identical to the iPhone 6 is no coincidence. The iPhone 6 feels great to hold, with its curved edges, and springy switches and buttons. 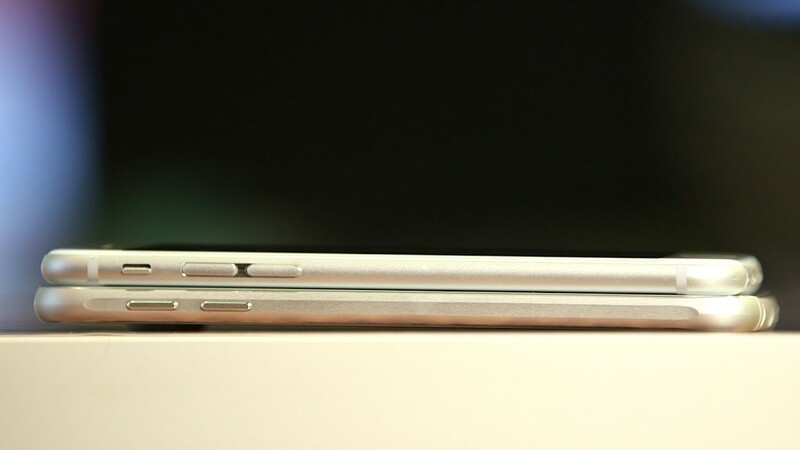 And it's super thin -- almost unbelievably so. Google's (GOOGL) Android 5.1 (aka Lollipop) is about as good as you're going to get in a mobile operating system. But the Moto X added just a few tweaks to Android that make it the best smartphone software on the planet. The Moto X knows when you're driving, at home or in a meeting and will automatically read your texts aloud, announce who is calling or respond with a custom text. When you take the phone out of your pocket, your phone will display the time. When you get a call, just wave at your phone to silence it. To snap a photo, just shake your phone -- even if it's locked. And when you get a notification, you can tap your phone to get a quick glance at who's trying to bug you. That's a smart phone. Most other Android phones add bloated features that you definitely don't need. And the iPhone can never claim to have the best mobile software as long as iCloud is a critical part of it. Most high-end smartphone cameras are more than passable as point-and-shoot replacements. But the LG G4 is so rad, it very well might be a DSLR replacement. The G4's 16-megapixel camera can snap photos in 0.276 seconds, and the camera app launches in just 0.6 seconds. It has a Laser autofocus. It's got a color spectrum sensor that helps the phone sense what the photo will look like before you take it. And it has a three-axis image stabilization so you can take smooth shots while driving over potholes. The G4 also gives you full control over the camera: Shutter speed, ISO light sensitivity and white balance are all adjustable, allowing you to take professional-grade photos (provided you know what you're doing). It allows in more light than any other smartphone camera, and its image sensor is 40% larger than its competitors. The 8 MP selfie camera is in a league of its own too, letting you wave at the camera to snap a photo (no selfie stick required). The Galaxy S6's screen is simply jaw-dropping. It's bright, the colors are brilliant, and the viewing angles are tremendous. It feels like a 4K ultra-high-definition TV in your hands -- because it kind of is. Its resolution is four-times more pixel-dense than standard HD displays. There is more space between the M9's "BoomSound" speakers and the nearest competitor than the distance between rivals in any other category. The M9 has front-facing stereo speakers. That alone makes the phone stand out, since most phones relegate the speakers to tiny pin holes in the back or the bottom of the phone. But in addition to just being louder than any other phone, the M9 features impressive software and Dolby virtual surround sound that make a Bluetooth speaker unnecessary. The Droid Turbo's 3,900 milliampere battery is just sick. It's nearly twice as big as the iPhone 6, a third bigger than the iPhone 6 Plus and the LG G4 and 21% bigger than the Galaxy Note 4. Verizon says it'll get you through two full days, but that's a bit of a stretch. Still, it'll get you through a full day (and then some) with heavy use. And it comes with a turbo charger that will give you several hours of battery life with just a 15-minute charge. It adds a bit of heft to the phone, but it's a small price to pay for never having to worry about your battery life. The brightly colored polycarbonate shell that Microsoft (MSFT) uses for its high-end smartphones is superb. It grips to your hand, it's durable, and it doesn't scratch (if you have a red phone, it's red all the way through -- it's not painted). The OnePlus One sandstone material feels a tad better in your hand than the Lumia, but it's too prone to scratching. The Qualcomm (QCOM) Snapdragon 810 chip found inside the Samsung Galaxy S6 and the HTC One M9 is faster and technically superior than the LG G4's Snapdragon 808. But the 810 chip is notoriously prone to overheating. We'll take a (very, very) slight hit to speed in place of not burning a hole in our pants. If we're building a perfect phone, it's got to have a quick and safe way to log in. The best way to do that is with a fingerprint sensor, and the best fingerprint sensor is on the iPhone 6. It's comparable in accuracy to the Galaxy S6's also excellent fingerprint sensor, but the iPhone's reader unlocks the phone just a hair faster than the Galaxy S6.